analgesic, antibacterial, antibiotic, anticatarrhal, antifungal, anti-inflammatory, antiseptic, antiviral, diuretic, expectorant, febrifuge, stimulant. Which Eucalyptus Essential Oil Is Best? 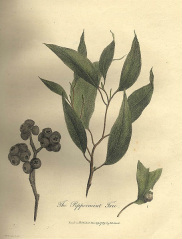 Eucalyptus - several species including; globulus, natriol azul, citriodora, dives, polybractea, radiata, staigeriana. With over 700 species the most well known and used for their healing properties are those listed above. Eucalyptus is well known for its decongestant properties and affinity for the respiratory system. Radiata is considered the most therapeutic and gentler on the skin than other varieties, use this variety for deep lung infection. Eucalyptus can be toxic if taken internally although it is approved by the FDA as a food additive and flavoring. Do not take this oil internally and keep out of the reach of children. Do not use on or around infants.